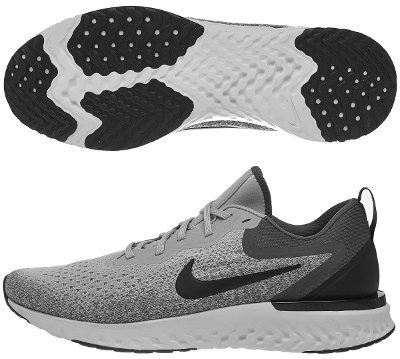 Nike Odyssey React are stability cushioned running shoes. Following big marketing campaign to promote Nike Epic React Flyknit, the popular american brand has released its second running shoe within React lineup: Nike Odyssey React. On one hand it seems Nike wants to introduce React foam among premium (aka higher price) running shoes to replace Zoom Air technology and on the other, keep Odyssey saga as top choice with (moderate) pronation control to face Adidas Ultra Boost ST as its most direct competitor. Although theorical predecessor should be Air Zoom Odyssey 2, there are so many changes that it is difficult to believe Nike wanted to keep Odyssey commercial name in place instead of launching a brand new one. Upper is not made of hyped Flyknit but of engineered mesh which is pretty breathable and combined with bootie construction, it provides a comfortable (enough to wear it sockless) and snug fit. Classical Nike logo ("Swoosh") dominates again both sides where Flywire™ cables no longer exist. Strange movement from Nike as they are available even on popular Zoom Fly. One of the advantages of React is that it is a synthetic rubber compound (not EVA based like most foams out there) and it makes less difficult to change its configuration (engineered geometry) depending on the area (in a similar way Saucony does with EVERUN in Liberty ISO) to perform as expected with moderate pronation support without typical (and most of the time, less progressive) medial posts although there is also a TPU unit in the rearfoot to provide extra stability. Full-length contact outsole added much more robust rubber in exposed areas to improve grip and increase durability.